We believe that every member of the body of Christ is very important in the fulfilling of God's plans and purposes. Each one of us has a very important part to play and significance in our lives is only found in serving the purpose for which we were born. God has connected us within Christ as a body where each member can contribute to the well-being and the created purpose of the body. What this means is that all of us are connected both together and to God's eternal plan for all mankind. Each of us needs to determine where we are to be connected and how we are to contribute to God's plans. We believe that a partnership is a special relationship that God uses to mutually bless all parties of that partnership. There are many ways that you can partner with One World Missions. All we are asking you to do is stand in faith believing God to speak to those He has selected to partner with us to see this ministry fulfill His plan. If you are one of those people, we believe that our partnership will be a blessing to all. We believe that partnership covers many areas. 1) We ask that you would commit to pray for us. Please click on the Prayer link for our prayer guide. 2) Another area that you can partner with OWM is to join us on one of our outreaches. The fields are ripe and ready for harvest. Our greatest need is for laborers. Click on the Outreach link to view our featured outreach for the next year. 3) You could partner with OWM by supporting the ministry financially. 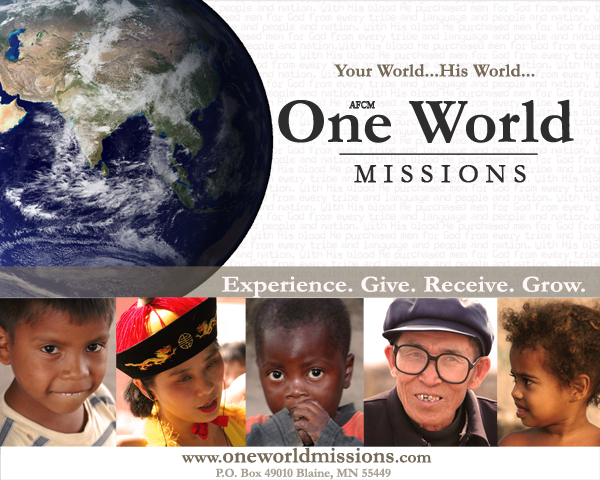 Click on our Giving link for more information about financially supporting the work of One World Missions around the world. We believe it is very important to consider carefully and invest wisely the resources that our partners contribute. For this reason work to avoid projects that would only increase long-term dependency. Instead we train leaders to do locally sustainable and locally reproducible ministry equipping them with effective methods for extending the Kingdom of God indigenously. We do not invest in costly infrastructure, believing that buildings should reflect local culture and represent the needs of local community. Instead we teach church planting principles that are fundamentally about discipling people. We work to train missionaries from the nations believing that western missionaries are not the only missionaries and may not be the best missionary for every task. We work to mobilize the body of Christ providing opportunity to participate in short-term outreaches that are fulfilling long-term vision. Each of our short-term outreaches is self-funded, taking no money from the operating budget of the ministry. We produce valuable educational resources to better equip the body of Christ to fulfill the Great Commission and we sell these at affordable prices so that cost is never a prohibitive factor. As you can see, One World Missions is working to do the greatest good with the resources that are available to us. It is for this reason we are asking you to pray about making a one time gift or even consider committing a regular amount to the ministry. This you can be assured of, when you give to One World Missions your giving will be wisely used to produce fruit that will remain.